← Are you thinking of getting your PRINCE2 foundation and practitioner accreditations? 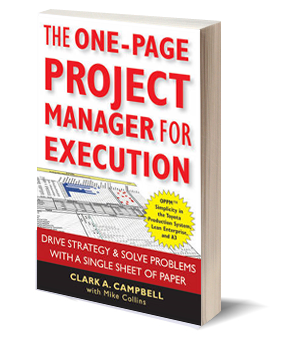 One of my guilty pleasures (I feel I can admit this amongst fellow PMs) is that I enjoy reading books about project management- and the seemingly endless array of philosophies, techniques and tools for getting the job done. Typically, books of this genre will polarise opinions: you either fully agree or fundamentally disagree with what the author is proposing. And I must admit, when I read the rather ambitious title of this book, I was more than a little sceptical. 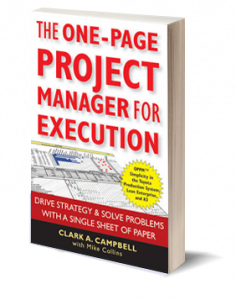 This book is not proposing a new methodology or even a technique – instead, it is concerned with project status reporting, and as the title suggests, it’s designed to enable Project Managers to provide a comprehensive update on a projects/programmes status on a SINGLE PAGE of paper. I’m regularly involved in managing complex multi-stakeholder, multi-vendor projects across global time zones – often with the most aggressive timescales, so the idea of fitting status updates onto a single sheet of paper seems decidedly optimistic. That’s until the authors let you into their first little secret. You’re allowed to report on a single page of A3 paper. (Yes, I can hear you all breathing a sigh of relief). However, in spite of their A3 page trick, I actually like this book – it encourages PM’s to apply the discipline of concise and relevant project status communications and I think that PM’s and businesses could benefit significantly from using this tool. The only pre-requisite is that the leadership/key stakeholders in your organisation would need to be willing to learn how to read OPPM and actually be interested in getting a project update that is longer than a 30 second elevator conversation. However, if all PMs in an organisation were using the single page report format consistently, then the business benefits are certainly clear – enabling you to communicate key information about any project in a few seconds. The book provides a useful step-by-step approach to help you develop a simple yet comprehensive project summary, built primarily around a gantt chart that details only high level summary tasks (the recommendation being 2-3 tasks for each planned reporting period). I loved the idea of having a subjective tasks section in the report for those times when an activitiy is not quantified on a timeline, i.e. improving software performance. Each task listed also has clearly identified an owner/task manager and task progress is tracked throughout the whole project lifecycle. Another useful suggestion is to identify 3-4 project objectives which are aligned to the different summary tasks, i.e. an objective may be change management and 12 of those summary tasks fall under that objective. The report also graphically tracks the project costs in terms of agreed baseline and current forecast, and finally there is a section for a pithy status summary. For those PMs or organisations that want to go to a more comprehensive report, the authors combine OPPM with A3 (a project status report developed by Toyota but now used outside of the company). A3 status reporting was of course named after the paper size of the report – incorporating the Deming cycle (Plan, Do, Check and Act) into the project status. The end result is a detailed project status report, but as mentioned earlier, successful application will depend largely on business buy-in and support for concise reporting advocated in this book. I have been told before to limit a project status update to “focus on the 2-3 key points you want to get across to senior management”, so in some companies with an immature project management culture, using this tool may seem like a lot of effort for the amount of work it takes to maintain it throughout the project. The authors also suggest that single page reporting can be used not only for managing projects, but also as a corporate strategy tool that can be used on 3 levels – corporate, business function and project team level. It is also positioned as being flexible enough to assist in business problem solving initiatives like Six Sigma and the scientific method – so the approach can be applied in other business contexts too. Overall, I found this book to be an interesting and thought-provoking read. Admittedly, there were a few petty niggles, including incorrect page-referencing of figures and diagrams, which was a little frustrating. I was also a little annoyed by the fact that so much of the early part of the book provides a summary of previous titles in this series (The OPPM for IT projects and The OPPM Project Manager) – which means you have to wade through 182 pages before you get to the main point of the book. A little ironic, given that the book claims to offer tools and strategies to improve concise project status communications – perhaps the authors should take a leaf out of their own book. However, in spite of my scepticism, I found this book to be a challenging and enjoyable read. I realised that many of my doubts about the approach were linked to the limitations of the organisation (from a PM maturity level perspective) rather than the actual concept of single page reporting. So, if you’re keen to develop a more succinct and focused approach to project status reporting, then this book is for you! This entry was posted in Book Review, Opinion, Project management and tagged Book Review, LinkedIn, Opinion, Project management. Bookmark the permalink.